Your case history will provide the doctors with as much information about you as possible. Where and when your symptoms first appeared (i.e. any unusual activity that may have caused your pain or any fall or minor accident that did not seem important to you at the time). Then the doctor will perform a series of tests to determine your cause of pain. You will then have x-rays taken for the doctor’s report of findings. 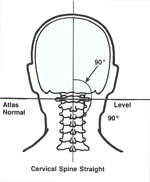 Exact measurements will determine your Atlas subluxation. 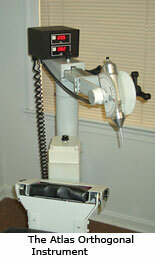 Specially designed instruments are used by the Doctor to detect and measure a misalignment. 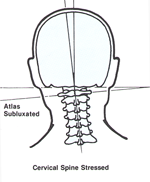 This information is necessary to determine the precise adjustment to adjust the Atlas and correct the subluxation. Headaches, pain in the arms and shoulders, even pain in the lower back, legs or buttocks can be traced to a subluxation in the cervical spine. 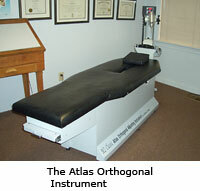 Your Doctor will then use the Atlas Orthogonal Instrument to adjust your Atlas and relieve your nerve pressure. Scanning Palpation will be done again and the Doctor will determine your degree of improvement. You will then have Post Adjustment Comparison x-rays taken. This will enable the Doctor to verify your progress.